Add motorized focus and servo zoom control to your camera. The industry standard zoom rocker and overall speed control knob combine to give you full control of your camera’s lens. This rear mounted controller sports a padded handle and convenient controls positioned for your comfort You also get a record start/stop button (red) and a return video button (black). The unit can be installed on a tripod handle or on your jib arm. This feature utilizes two 22′ or 32′ cables fitted with 6 pin XLR connectors and 8 pin DIN connectors. Custom lengths are available. This unit is also adaptable to Mini-DV, HDV, RED, Film or SLR type cameras. Unit includes controller,zoom extension cable, focus extension cable, lens motor assembly, y cable, power supply and focus gear of your choice. Add wireless operation to your ZR4FZ. When the optional wireless version is ordered, you receive a transmitting radio module installed in the ZR4FZ base unit and a ZR4W receiver unit with the same output connectors as the main controller. This receiver is also powered via a 12vdc 4 pin XLR female power supply connector. This unit is also fitted with an articulating antenna. This option allows the system to operate wireless up to 3000 feet (1 km) or more. Add motorized zoom control to your film, DSLR or other camera lens that does not have a ‘built-in’ zoom servo motor. 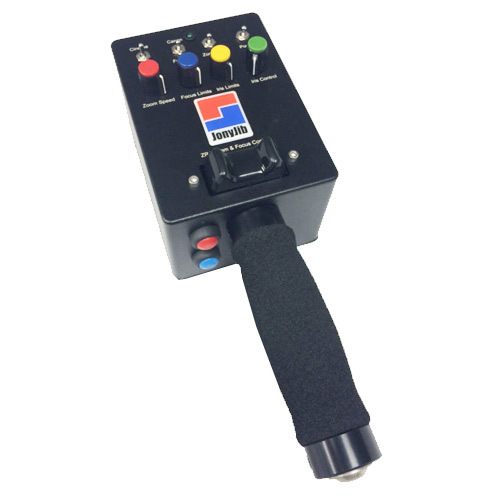 This option uses the standard zoom rocker control (switchable between video & film) an additional spring tensioned servo motor assembly. It also includes a continuous rotation style motor and gear. This option utilizes the same cable as focus control. Item includes zoom control integrated into focus controller, lens assembly and iris gear of your choice. Add iris control to your camera with this option for the ZR4FZ. This option adds an additional control knob and an additional spring tensioned servo motor assembly. This option utilizes the same cable as focus control. Item includes iris control integrated into focus controller, lens assembly and iris gear of your choice. VIEW OUR JONYJIB BUNDLES AND SAVE NOW!